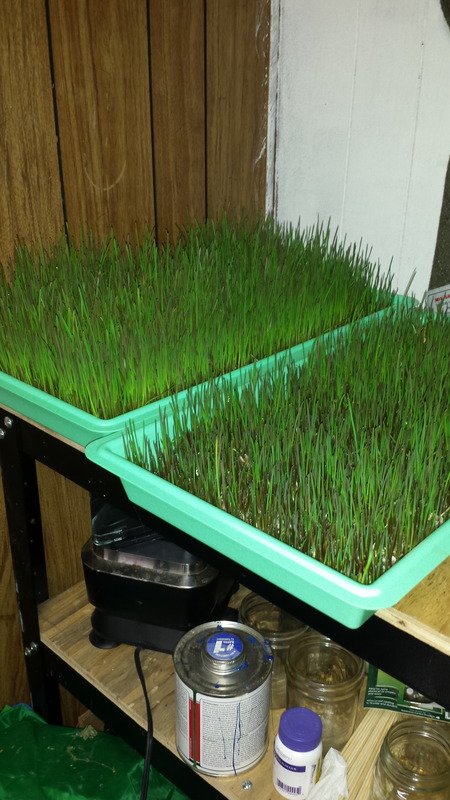 I’ve begun fodder experiment number 2, using triticale and barley. This isn’t a nutrition comparison. I’m only doing a time test. I want to see which one gets to harvest faster. I’m also testing based on temperature. The fodder is growing in a room that has no heat other than from the rest of the house. While it doesn’t dip into the freezing range, it’s mostly in the 40s and 50s. I did put the seed trays under a grow light for some warmth. Here’s the first test, where I used rye. 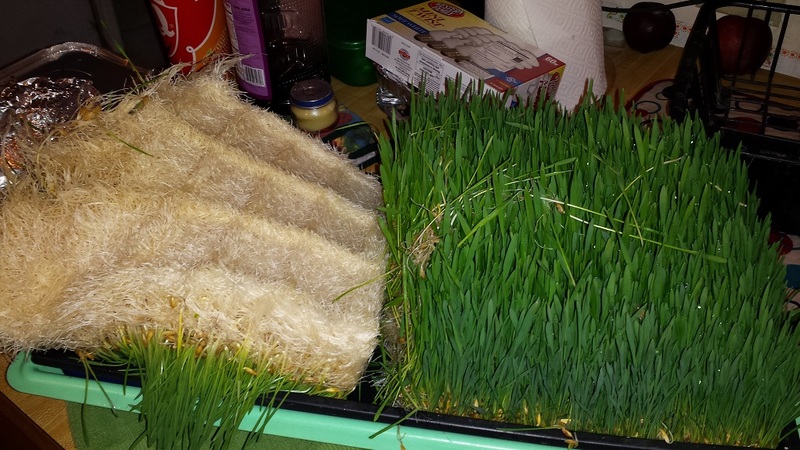 Basically, even though I didn’t drain the trays well, didn’t attempt to adjust humidity or temperature, used too much seed, etc., I got fodder. The chickens loved it. Satiety was achieved. So. Rye isn’t cheap. It’s around $400 a ton for me. It’s not something I can source locally either. Why did I use rye for my first test? I was able to purchase a 5 lb. bag. That’s cheaper than a cheap 50 lb bag of barley or triticale. I got enough “happy” from the first test to invest a bit more. 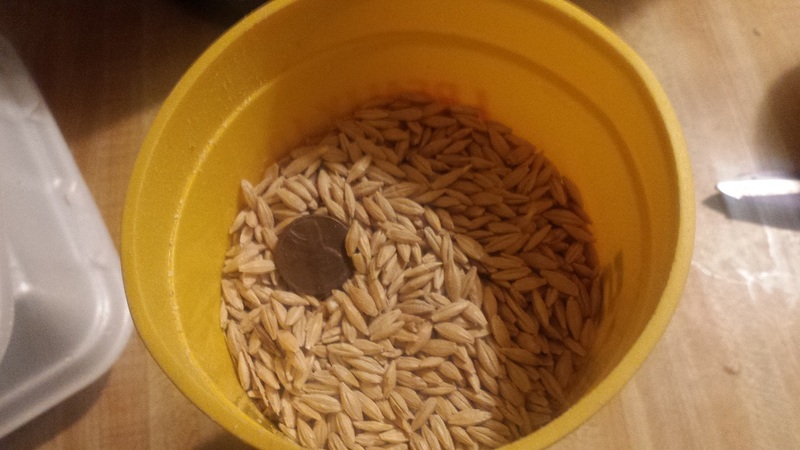 I figured I would do barley because it’s what everyone does. I’d also do triticale because I think barley has an issue or two as fodder seed. Triticale is a a cross between rye and wheat. Don’t go GMO-crazy on me–triticale has been around for over a hundred years. Monsanto had nothing to do with it. Anyway, wheat is great for nutrition and rye is disease-resistant. I’m curious to see how quickly it grows compared to barley. Barley is great. It’s cheap. It’s nutritious. It grows fast. What’s not to like? Well, people have trouble with barley sprouting in warmer temps. It turns out that growth starts falling off above about 65 degrees. That’s an issue for me. I don’t plan on running air conditioning for fodder. 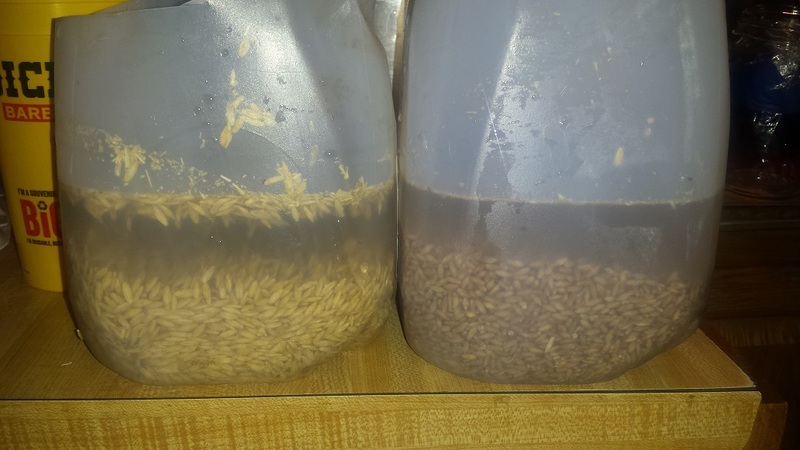 So, I’m going to try several grains compared to barley in a high temp environment. But not today. I threw in a penny to give you an idea of its size. It’s a lot “fluffier” than triticale, takes up a lot more volume for the same weight. I took 2 lbs of each, rinsed and let them soak for 18 hours. I didn’t use any chemicals. The water was straight from the tap and is very hard water. There was a lot more floating trash in the barley. After the 18 hour soaking, I rinsed the seeds and put them in their grow trays. 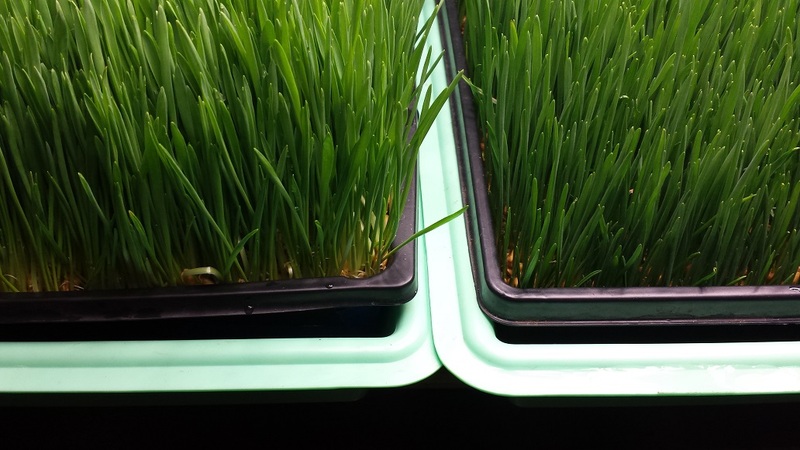 The grow trays have small holes in the bottom to aid in draining. I set the trays in green trays that are heavier duty. There’s a gap between the two trays that should collect the extra water. 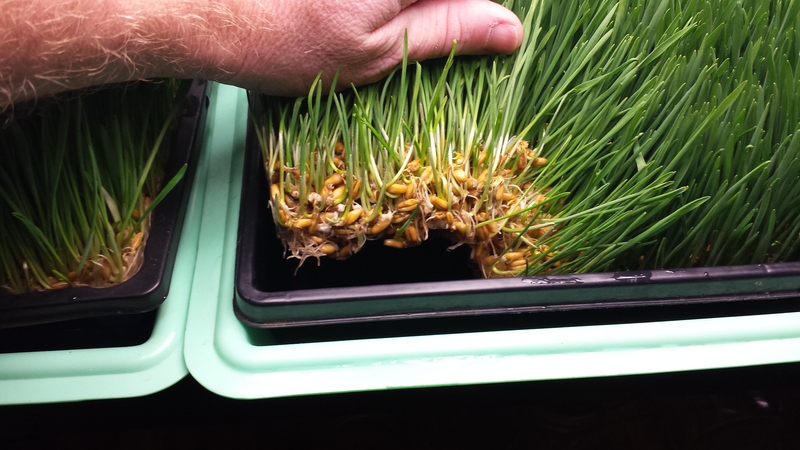 Interesting note: The triticale is already sprouting. No sign of life in the barley yet. Water and drain. The triticale looked the same. So did the barley until I moved a bit of the topmost seeds. I can see the beginnings of sprouts on the seeds underneath. I wouldn’t be surprised to find out that my trays are drying out too much. I think I’m behind a day. I started rinsing twice a day here. Day 4, 5, 6, 7… Slow growth. I’m sure this is due to temperature. Fast forward. 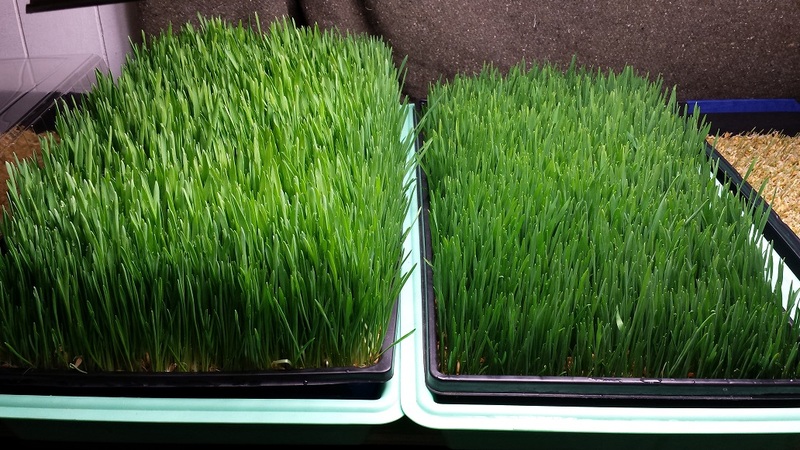 The pic above shows barley on the left, triticale on the right. 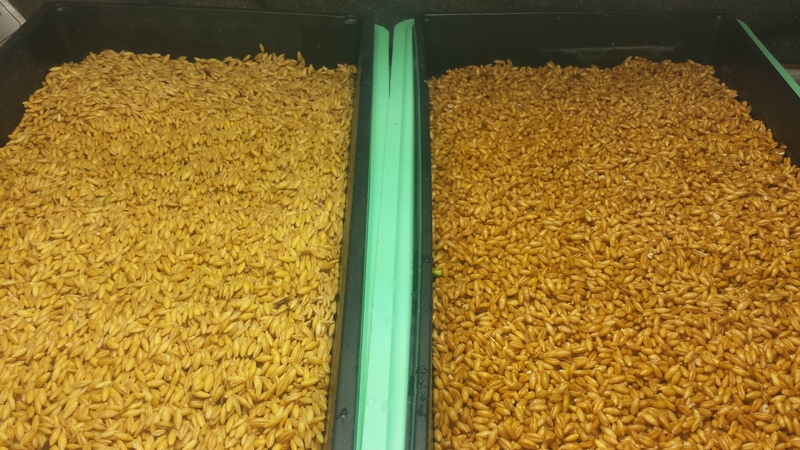 You can see that the barley has filled up the tray, but the triticale is well below the lip. The Triticale mat isn’t strong at all. I weighed the barley the night before I harvested. It came in at 13.8 lbs. Some things I want to point out. 1. 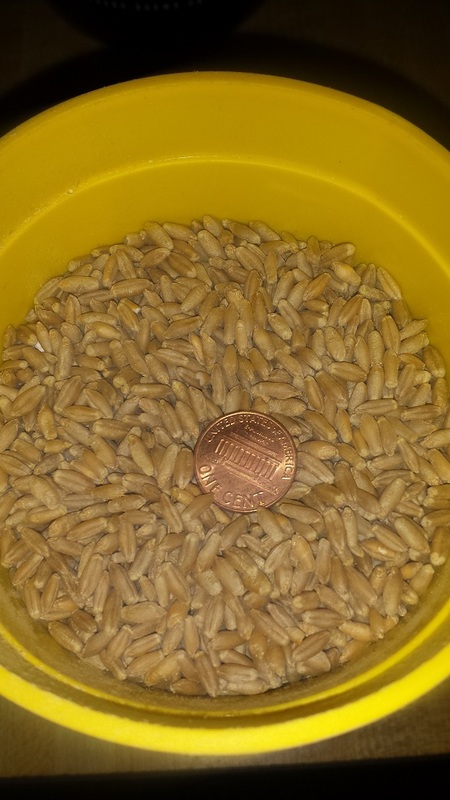 Barley seed is lighter/smaller than barley seed. My test used 2 lbs of each. 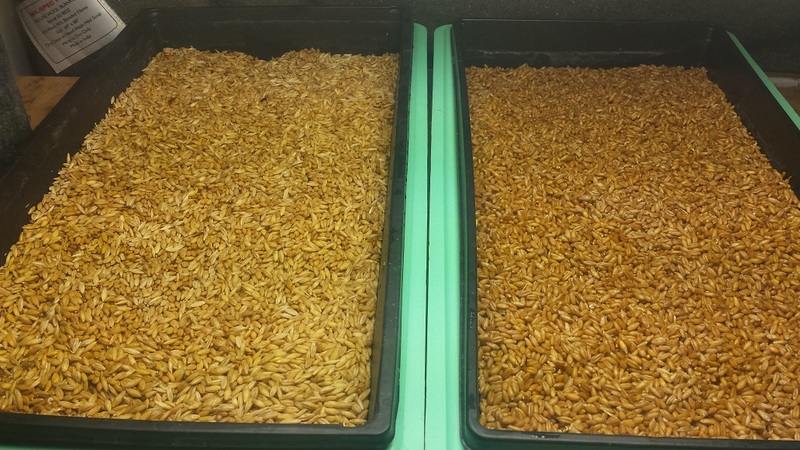 This means that there was a lot more barley seed in the tray. 2. The triticale doesn’t like cold as much as the barley. 3. This test shows nothing regarding nutrition. Here’s what I know. The price for triticale is roughly the same as barley. I get more seed per lb with barley. Barley appears to grow better in cold temps. 2 lbs of barley gets me over 13 lbs of fodder, which is a good ratio. I’m going to see what options I have for checking the nutritional value of the triticale fodder. This entry was posted in Plants, Shrubs and Trees and tagged barley, fodder, temperature, triticale by admin. Bookmark the permalink. Just read this post because I keep forgetting to read y’all’s blog! 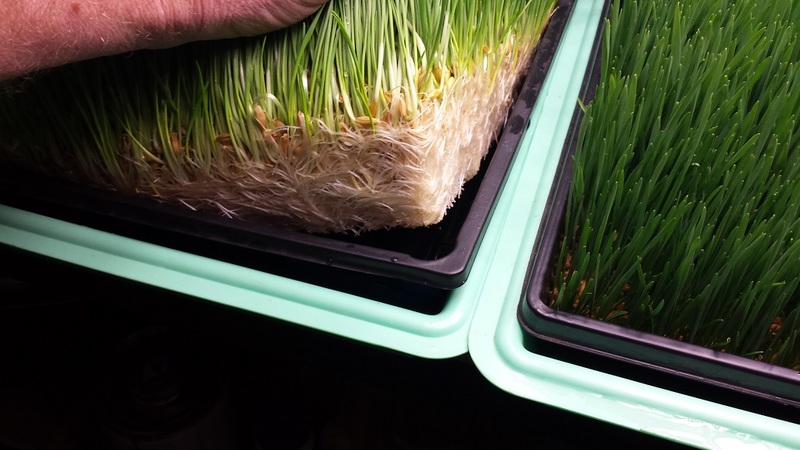 Are you growing this for feed for your animals? Ground cover? To eat? I’m curious. This is for chickens and pigs. There’s a lot more labor involved, but feeding fodder could cut our feed costs by more than half. We’ll just need to make sure the critters are getting everything they need.